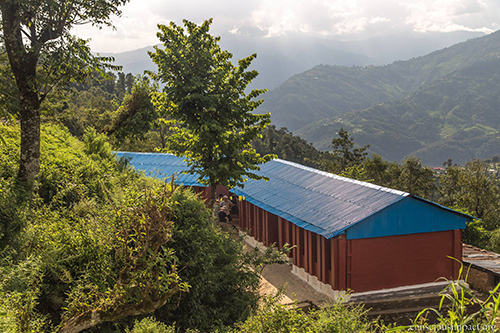 The following first-person narrative was provided by Oliver Atwood, a recent UVA architecture school graduate and current Mark English architects employee who traveled to Nepal with Conscious Impact to help villagers rebuild after a major earthquake. 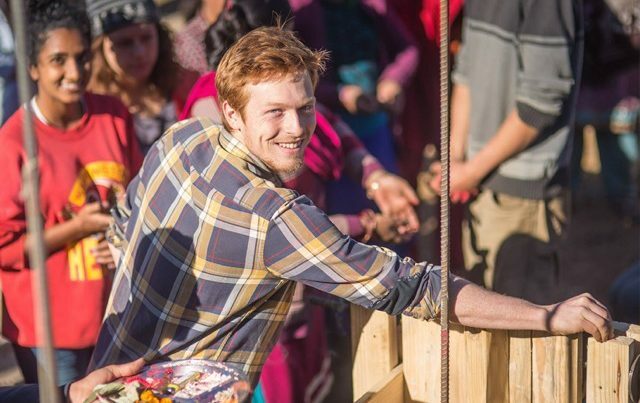 Using local knowledge and ancient vernacular building techniques, re-purposed for the modern age, Oliver worked with a team of volunteers for several months in Nepal. All photos courtesy of Conscious Impact except as otherwise noted. In April of 2015, an 8.1 magnitude earthquake rocked Nepal, causing widespread damage and killing over 9,000 people. 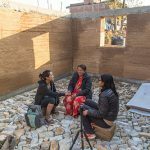 In January of 2016, I headed out there with the intention of using what I’d learned in architecture school to help the Nepalis rebuild – but also seeking the kind of education not found in schools. I’d learned much through reading and lectures at the University of Virginia, but I wanted to learn through doing. 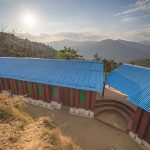 This school in Nepal was rebuilt after a major earthquake in 2015, by volunteers, out of Compressed Stabilized Earth Blocks or CSEB, a form of modular rammed earth construction. 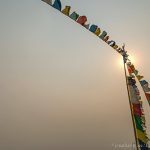 A few days after my plane descended through milky layers of smog into the cacophony of Kathmandu, I found myself rumbling up the mountains in a bus destined the Sindupalchok region of Nepal. 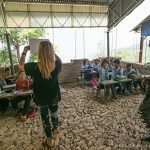 Riding on an overladen bus tottering along the edges of steep ravines, I slowly made my way up to a volunteer camp run by Conscious Impact, a fledgling non-profit organization focused on sustainable earthquake recovery. When we arrived, we were greeted by a large group of people from all over the world. The volunteer camp was suffused with a special kind of energy that comes about when people from many different places and cultures converge around a shared purpose. For this group, that purpose was the recovery of the nearby villages of Takure and Nawalpur. 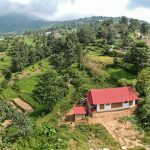 Tucked into the picturesque mountainside, these small yet vibrant agricultural communities had lost 90% of their buildings to the earthquake. 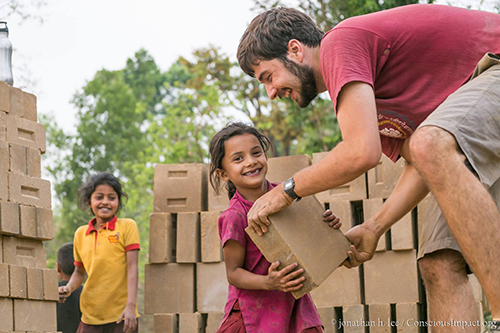 We all worked long hours – some teaching at the schools, some working in the garden, and some making earth bricks at the “Training Center.” In each of these venues, hard work brought us closer together. 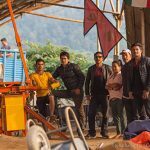 Foreign volunteers and local Nepali workers sweated side by side together in the hot sun, harvesting soil from the mountainside and mixing it with sand from the river. 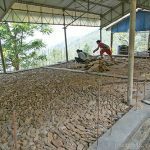 We stabilized the mix with a small percentage of cement and poured it one scoop at a time into a powerful brick-making machine called the Auram 3000. 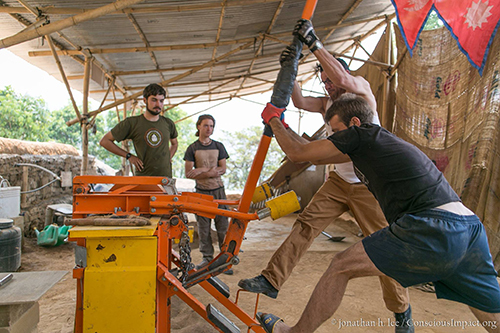 This machine, developed by the Auroville Earth Institute in Auroville, India, compressed the loose loam mixture into square bricks. This was the rhythm for months: harvest, mix, compress, and stack. Soon, the production facility was encircled by many large stacks of bricks that then had to “cure” for 40 days. As the stacks cured, more bricks piled up, eventually numbering into the thousands. 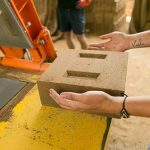 CSEBs were made using a specially-designed brick press from the Auroville Earth Institute, called the Auram 3000. At first, we didn’t have a building planned for the bricks. The idea was to build up an inventory over time and listen to the needs of the local community before deciding on a project. Several members of the community expressed to us the importance of rebuilding a school that had been badly damaged in the earthquake. The old school had been built from a series of steel columns set on a shallow foundation, with supporting steel trusses and a corrugated metal roof. Stone walls, held together by mud mortar, had been built around the columns to enclose the classrooms. During the earthquake, these walls had crumbled as the columns flexed around from within. Fortunately, the roof and steel columns of the three school buildings had endured the earthquake largely unscathed. Another volunteer, a Canadian architect named Frederik Dolmans, developed a design which incorporated these surviving elements. Dolmans’ design called for improved foundations and buttressed walls built of the earth bricks we had been producing since January. In the spring of 2016, we began transporting the cured bricks downhill to the school, one truckload at a time. 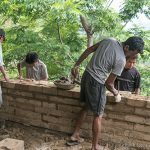 The construction site began to fill with stacks of bricks as a team of masons started work on the new foundation. The construction method for these particular earth bricks incorporated a series of vertical reinforced concrete “cores” inscribed within the walls at structurally-vulnerable locations. In Fred Dolmans’ design, these “cores” were located at either side of every window and door and at the corners of each wall. As we were informing the masons about this style of building, they were already hard at work on the new foundation, expertly stacking stones in gabion cages on the downhill side of the buildings and laying the groundwork for the new plinth beam. Once these foundations were completed, the masons began laying bricks on the concrete plinth beam in various arrangements around the rebar cores. The local kids loved visiting the construction site to help move bricks when they were off school. Photo credit: Jonathan H. Lee. 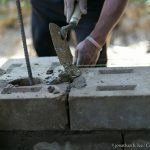 With the walls growing ever higher, the bricks continued to flow from the Training Center with increasing efficiency. Specialists began to emerge from amongst our crew. The attitude was always jocular and athletic, and as sports teams grow closer, so did we. Through the many meals we shared together, we came to better understand each other’s cultures and where and how help was called for within the village. We could never have understood local needs without growing closer to the villagers themselves. Over time, they gave us insight into the most pressing issues of their community. This interplay of local and foreign knowledge was one of the most important aspects of the recovery process. It took two people several “pulls” of the lever to press a single brick. It was certainly hard work, but we still had fun. 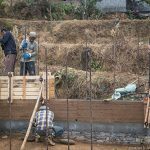 I left Nepal in May of 2016, as school construction began to wrap up. 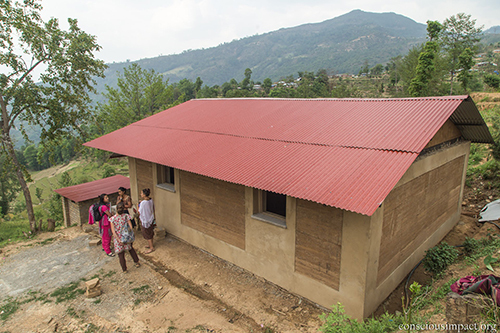 The school was completed by the local masons and a small volunteer crew. By June, the rainy season began to close in and camp was packed up for monsoon. 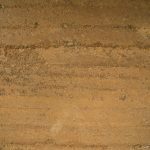 Rammed earth is not a new method of construction. Rather, it is an ancient way of building that can be traced back to Mesopotamia, with examples all over the world. 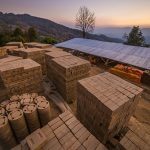 At Rammed Earth Works, they have infused this vernacular building technique with modern concepts of engineering and construction to create an entirely new building material. 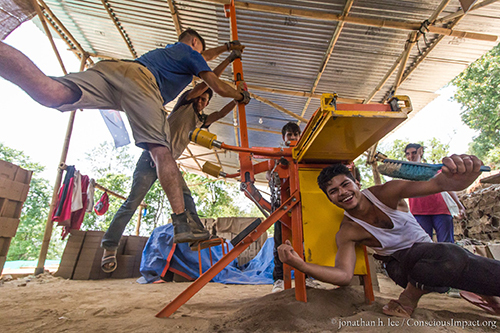 Rammed earth construction is a simple yet nuanced craft. 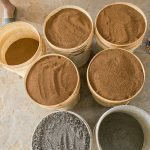 A mixture of soil, sand, and gravel is combined with (if available) a small percentage of cement and subsequently hydrated with water to a suitable wetness. This hydrated mix is then thrown into a formwork and compressed (rammed) in layers by workers wielding tampers. Once the layering reaches the top, the forms are removed and the finished wall cures over the following days. 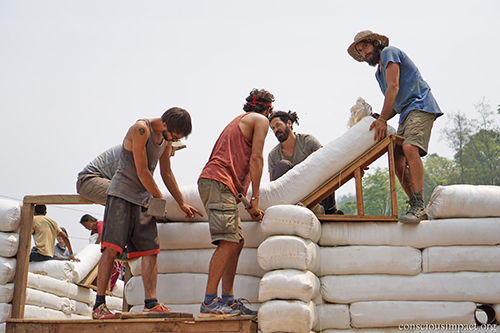 On the other side of the planet, Rammed Earth Works in Napa has refined this ancient vernacular craft into a science. 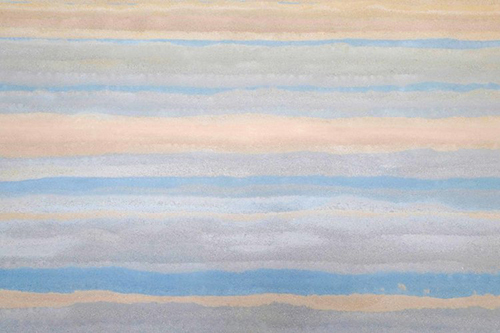 At Rammed Earth Works, the nuance of this craft has been elevated from simple to sublime. Coming from Nepal, the contrast was striking. The primary difference between the two contexts is owing to simple economics. 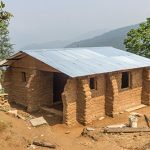 In developing countries, labor is cheap and materials are expensive: building with local materials, even if it is labor intensive, makes sense. 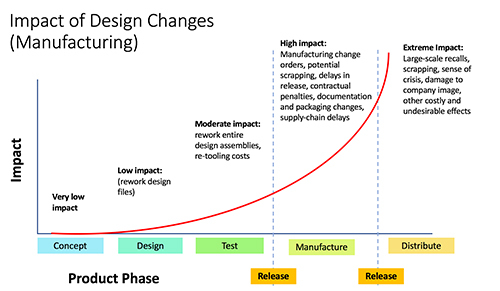 By contrast, in developed countries, labor is expensive labor and transportation is cheap, making techniques like prefabrication and automation more attractive. 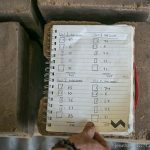 These conditions have led Rammed Earth Works to develop a variety of products around the same base concept of compressing earth. 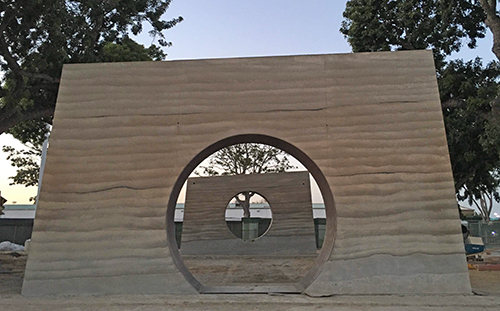 In addition to the more traditional cast-in-place rammed earth, they produce prefabricated rammed earth veneer panels. 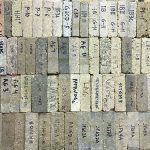 Their sister company, Watershed Materials, produces compressed earth blocks which are dimensionally identical to concrete masonry units (CMUs). 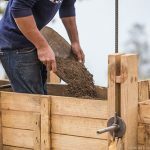 In a later article, we will be digging deeper into Rammed Earth Works’ practice of their craft and the broader implications of resurrecting an ancient building technique in the modern age. A wide range of colors are still possible even with all-natural soils. 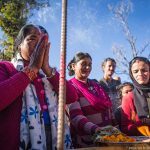 During my initial stay in Nepal in the spring of 2016, another clear opportunity for a project had emerged, one that could greatly benefit the community: the rebuilding of an office and meeting hall for a local women-run microfinance co-operative. This organization is a cornerstone of the community. 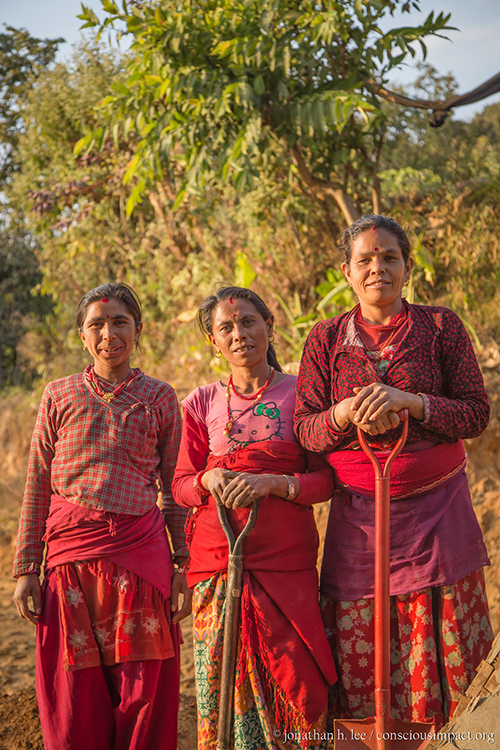 It not only provided loans to people within the village, but also served as a forum and a safe space for women. They had lost their building in the earthquake along with the other 90% of structures in the region. Without it, they were holding meetings in their homes and in makeshift tea houses by the roadside. 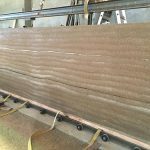 Between August and December of 2017, I was working at Rammed Earth Works. 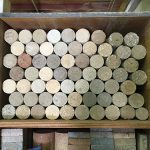 My days were spent building rammed earth walls, making shop drawings, or testing mix designs. My nights were spent developing a set of drawings for the women’s co-op project back in Nepal. With combined advice from David Easton in person and Frederik Dolmans remotely, I developed a design for a simple rammed earth building that aimed to strike a balance between sustainability and earthquake resistance. 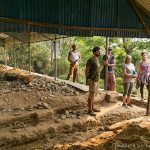 I coordinated with volunteers on the ground in Nepal to check the post-monsoon site conditions and stake out the foundation. 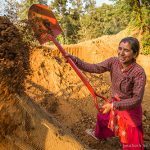 I then flew out to Nepal again in January 2017 to supervise the construction of the co-op. This departure time worked out well for leaving Napa, since wintertime is California’s rainy season and rammed earth construction requires drier weather conditions. 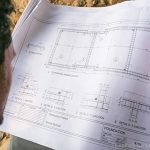 When I returned to the village, the team there, led by Satwika Taduri and Nitzan Iserovich, had completed the foundation, and the plinth beam was curing. 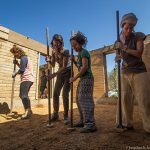 Together, we ran a number of workshops for volunteers and local masons on the basics of rammed earth, and experimented with a few different mix designs for the soil from the foundation excavation. Eventually, we settled on a ratio of soil to gravel to sand with 8% cement to stabilize. Three wood forms for constructing the wall segments were built by a local carpenter. These forms were designed to be able to build all of the different sizes of wall segment we would need for the project. Segment by segment, the walls were built over the course of a month. Many people worked together to measure, mix, and ram the earth into the formworks. The masons took to the technique quickly, and women from the co-op played an active role in the process. Once complete, the walls were topped out with a concrete lintel beam and a set of site-welded steel roof trusses bolted down to the beam. As with many buildings in Nepal, the intention was to allow for a second story to be added to the structure in the future. As such, the entire roof was designed to be removable to allow for upward expansion. Just as at the Training Center, the construction process served as a uniting force between members of the community and volunteers. The shared act of building brought people together in a way that transcended barriers of culture and language. 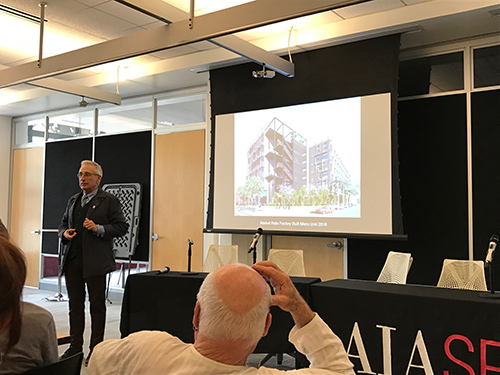 It also served as a demonstration of an alternative building technique for affordable and durable construction. 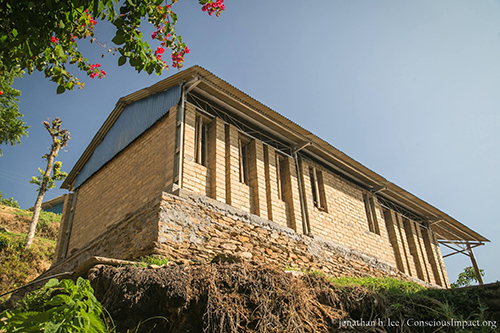 The completed building now sits steadfast on the mountainside as a symbol of the Women’s Co-op and its inherent importance within the community. 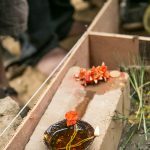 It will continue to serve as a place for the women of the community to take an active and enduring role in the rebuilding of their village for years to come. 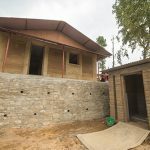 In the year since that project was completed, Conscious Impact has built a number of homes using a third technique of earthen construction: earthbags. This is arguably the simplest approach to building. At its most basic, a long tube of cross-woven polyethylene bag from a continuous roll is filled with earth of any kind and tamped flat. Once one layer of compressed earth-filled bag is complete, another is laid atop the first, with barbed wire in between to bind the layers together. Once the walls are complete, they are covered with plaster to protect the bags from UV light. If the plaster is maintained, walls of this kind can last thousands of years. 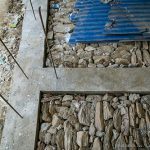 The fact that the binding element of the wall is on the outside of the wall in the form of a “bag” makes these types of walls especially earthquake resistant – even if the material within the bag “cracks,” the bag and thereby the wall will remain intact. 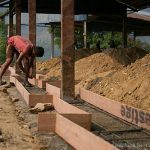 This flexibility, combined with the affordability of the materials used, makes earthbag construction an ideal method for building in earthquake-prone countries with developing economies. Around the world, earthen construction takes many forms. In almost every case, it represents a less carbon-intensive way to build long-lasting structures. 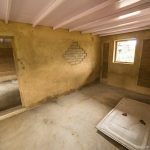 Whether they be of compressed earth bricks, rammed earth, or earthbags, properly maintained earthen structures will last hundreds if not thousands of years. At the start of the 21st century, global warming is a harsh reality. It is abundantly clear that drastic changes must occur in the way we live on this planet if our species is to continue. The built environment is certainly no exception. Currently, cement production alone is responsible for 8% of global carbon emissions. Reducing the use of cement is a sizeable piece of the puzzle in fighting climate change. 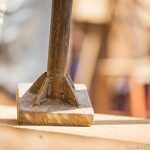 Construction techniques that reduce or eliminate the need for cement are a great way to decrease emissions. 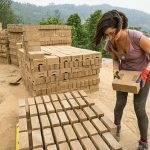 In developing countries, where materials and transportation are expensive and labor is cheap, earthen construction presents a cost-effective alternative to the more common methods of reinforced concrete and fired clay bricks. As these countries develop, it is imperative that they do so in less carbon-intensive ways than the now-developed countries which preceded them. 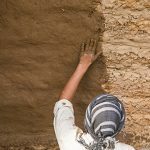 Through use of earthen construction techniques, it may be possible for the developing countries of the world to skip the messy industrial revolution phase of development altogether and instead join us in the post-carbon future.